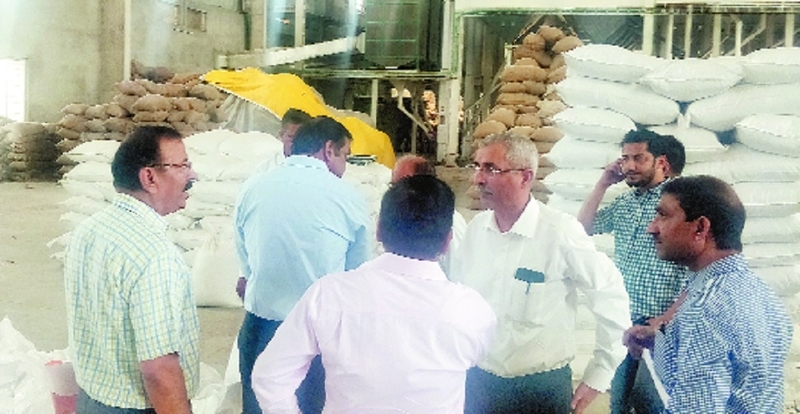 Satish M Gavai, Additional Chief Secretary of Industries, Energy and Labour Department, Maharashtra and Harshdeep Kamble, Development Commissioner-Directorate of Industries, visited the common facility centre (CFC) of the Nagpur Dall Mill Cluster at Mahalgaon on Wednesday. They were accompanied by Ashok Dharmadhikari, Joint Director of Industries, Nagpur and Gajendra Bharati, General Manager of DIC, Nagpur. The purpose of the visit was to interact with cluster members and discuss future interventions to be pursued by Nagpur Dall Millers Cluster Pvt. Ltd (NDMCPL-SPV for development of the cluster). CFC has become fully operational since May 2017 and is India’s first CFC for Dall Milling sector developed under assistance of the Micro & Small Enterprises-Cluster Development Programme (MSE-CDP) of Ministry of MSME. Members of the SPV-NDMCPL Manohar Bhojwani, CMD, Suresh Bhojwani, Director, Sulabh Gupta, Director, Pappu Bansal, Shankar Agarwal, Yogesh Bhojwani and several others were also present. Suresh Bhojwani said, the successful implementation of Dall Mill Cluster CFC was the result of support from several people including officials of Ministry of MSME, Directorate of Industries, MIDC, LIT-Food Technology Department and others. They had contributed in successful execution of the project. Ashok Dharmadhikari created a good environment for clusters in the region. Manohar Bhojwani said, Dall Mill Cluster CFC of Nagpur is a dedicated service center for pulses processors. It has pre-processing and post-processing facilities like pre-cleaning, fine cleaning, de-stoning, gravity separation, solar drying, colour sorting, modern bagging and packaging, laboratory services and GI storage silos. Both pre-cleaning line and post processing line have capacity to process 12 tonnes per hour. He said, “The project is an important growth centre and already transforming the quality of product being developed by millers. The premium quality not only offers platform for better prices, but also ensures food safety.” Members of SPV explained working principle and importance of each machine in the line. Sulabh Gupta said, the Solar Dryer System installed in the CFC is India’s largest pulses solar drying system. The members of SPV and non-members are availing services of the CFC on regular basis at highly competitive rates. Several interventions are also concurrently being pursued by SPV to create strong linkages with backward integrated farmers. Over 500 farmers visited the CFC and were given one-day training. There is direct procurement by member units from farmer producer companies (FPCs) on a small scale is being done. This will enable the FPCs to get rid of middlemen in supply chain and thereby increase farmers share in the value chain. The members of SPV also took up various issues if resolved will lead to much greater growth and create opportunities to the cluster units. They demanded that there is dire need to develop the critical infrastructure in proximity to CFC which includes proper approach road, solar power and solar street lighting. Manohar Bhojwani said, “Dall Cluster CFC is a perfect fit for consideration of developing Industry Incubation and Training Centre and this is also corroborated by the fact that several farmers and new entrepreneurs have been visiting for training in last one year.” He strongly advocated the need for by-product processing centre, as low price realisation in by-products has been the major reason for low profit margins of millers. Taking cognisance of the issues, both Gavai and Kamble said that SPV should submit appropriate proposals and same would be considered for approval on priority basis. Both the top officials also discussed scope of development of higher value added products by industry units like pea protein, pulses based extruded products like pasta, etc.